The Kosunen Racing is a private motorsport team from Finland. The latest action shots from the team in our picture gallery & video gallery. Be sure to check back often as we will be constantly updating this site with the latest photos, videos etc. A four-season motor sport in gravel, snow, ice and tarmac. No, no four-wheel drive, and the F-M3 Group of BWM or to expensive new R-classes of devices. 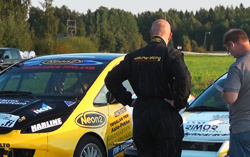 Many people write forums how expensive rally car are and actually do again differently. Since the summer of 2012, the garage has slowly built up a so-called "Häjy", a Finnish Trophy class Skoda Felicia Kit! four-wheel drive class is the most experimental car"
Join Facebook to start connecting with Kosunen Racing Team. Lots of information about the car build and development. Rallysprint: Mitsubishi Colt Evo'WRC and rally use: Skoda Felicia mini'KIT.